Into the traditional tram archive again today and we are back in Devon for a view of the Seaton Tramway. 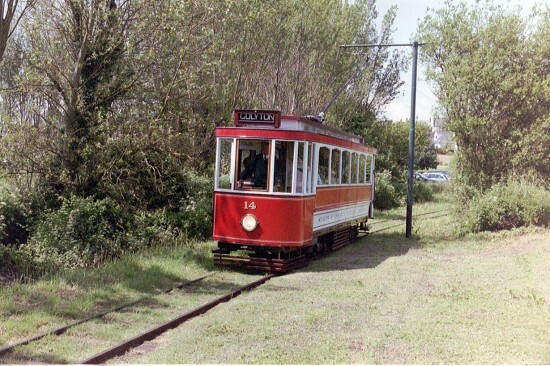 The tram shown here is 14 in the Seaton Tramway fleet which is one of three trams which has been converted for use on the 2’9” gauge tramway from an original first generation tram. In this case 14 started off life as Metropolitan Electric Tramways 94 (renumbered as 2455 upon takeover by London Transport) which was a double deck open topper built in 1904 and withdrawn in 1935. A group of enthusiasts initially started work on restoring the tram to its original condition with the tram body transferred to Eastbourne in 1961 for work to start. However, progress was slow and in 1968 ownership transferred to Modern Electric Tramways. The decision was then taken to convert the tram into a single deck saloon for operation at Seaton – the first of the conversions to take place. Entering service on 2nd June 1984 14 has remained part of the operating fleet ever since. This photo shows 14 on the way to Colyton having just departed from the terminus at Seaton in 2003.